A long history of violent cosmic collisions allowed Earth to become the unique and hospitable planet it is today. Earth may be the most hospitable place in the universe that we know of, but our planet would never have become such an ideal place to live if it weren't for a series of violent and catastrophic collisions. Watch astronauts explain how our unique planet arose out of a destructive "cosmic storm" in a new episode of "One Strange Rock," which airs tonight (April 2) on the National Geographic Channel. "One Strange Rock," which premiered on March 26, explores some of the most peculiar and extraordinary things about Earth, the features that make it such a special planet. 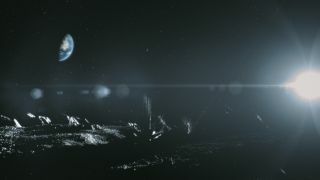 The series is hosted by actor Will Smith, but astronauts take the lead in telling the story of Earth, invoking a cosmic perspective derived from their unique experience of seeing the planet from space. After about 100 million years of countless collisions, the Earth was born. But the violence was far from over — and that's a good thing, Stott explains. For the first few hundred million years of Earth's existence, asteroids and comets bombarded the young planet. While a collision with such a space rock could have wiped out life on Earth later (like the asteroid that killed the dinosaurs), these early collisions were critical for life to develop on Earth. The impacts brought to Earth the most crucial ingredient for life: water. We also have a much bigger cosmic collision to thank for our closest celestial neighbor, Stott explains. Scientists believe that the moon formedafter Earth smashed into a Mars-size object known as Theia, which was orbiting the sun in a path that happened to intersect with Earth's orbit. Without the moon and the tides that it creates, life on Earth could have turned out much differently. And some scientists believe that life would not have developed on Earth at all. To learn more about Earth's "tale of destructive good fortune," as Stott puts it, tune into "One Strange Rock" tonight at 10 p.m. EDT on the National Geographic Channel.